The first Hell On Wheels races that I had the pleasure of checking out was one of the Halloween Hill Climbs some odd years back. I had just moved out to the IE (Inland Empire) and found it much easier to ride out to Glen Helen instead of the hundred something mile ride from San Diego, so I finally made it out to one. What I expected and what I saw were two completely different things. Everyone was there for one thing and one thing alone, to have a good time. I immediately knew that this was something special and that I would continue to come out and try to capture the spirit of the Hell On Wheels races. The man behind this salute to the good old days of dirt bike racing is Meatball and the Hell On Wheels MC. Meatball has been putting on these races for quite a while, and his goal has always been to bring back the good time atmosphere of racing back in the day. The whole atmosphere is just a big party, with everyone hanging out, racing, and drinking...all with open arms to newcomers. No attitudes, no corporate sponsors, and an open format that allows pretty much anyone to ride anything. Beginners, intermediate, and advanced riders are all welcome to come and race whatever they bring, just as long as it runs and has two wheels. This is my favorite thing about the Hell on Wheels races, the variety of bikes that are brought out. Everything from vintage pre-‘75 dirt bikes and tank shift Indians to stock cruisers, mini bikes, and choppers. It is a cavalcade of bikes pieced together, that probably have no business running but do anyway, as it should be done. 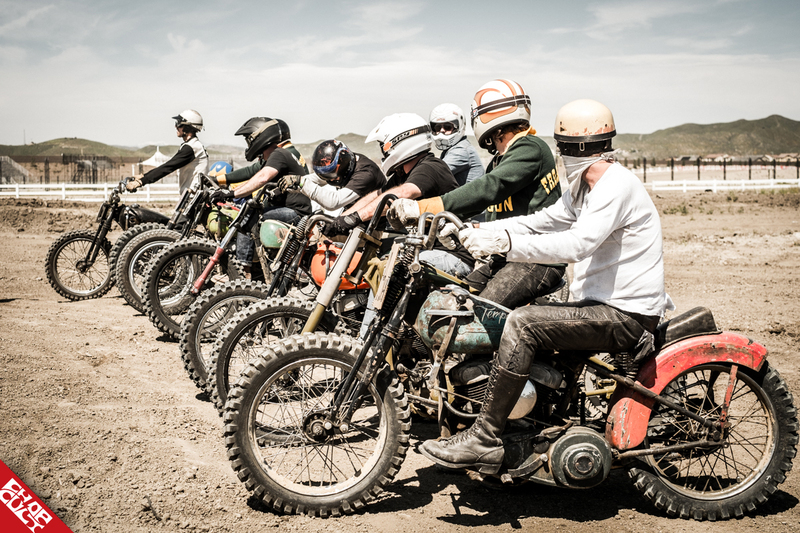 March was the Hell on Wheels TT Scrambles at Lake Elsinore Raceway and was a great way to start off another new year of good times and two-wheeled antics. Come on out to the next race and join in on the fun. If you are new, do not feel put off to race, everyone is extremely encouraging, and really are all about helping out and giving tips; it is a community. Make sure to give Meatball some love and thank him for organizing these races and putting up with all of our shenanigans, I know I would not want to! 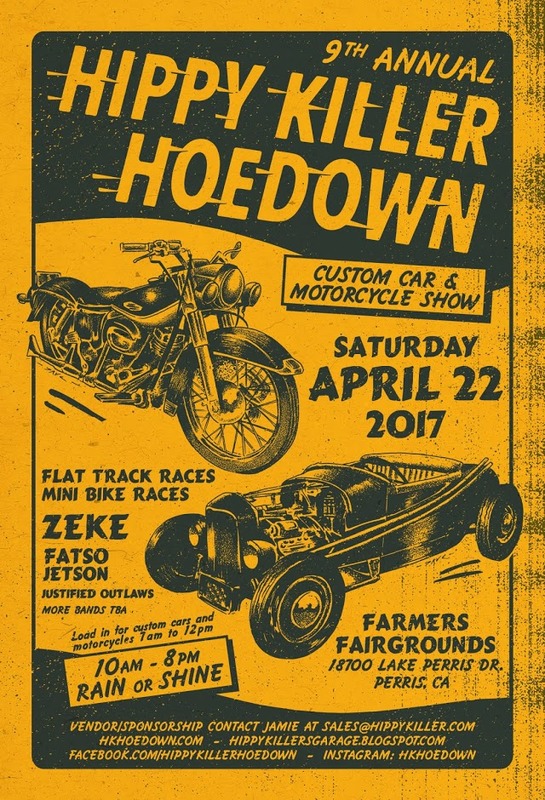 Hell on Wheels will be having their next races at Hippy Killer Hoedown this Saturday so make sure to sign up now if you have not done so already before the rider cut-off date! You can preregister here. 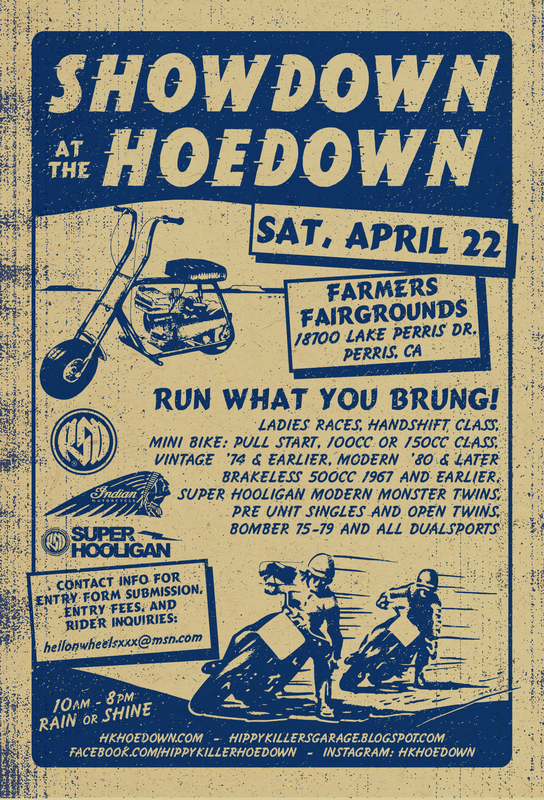 Details for the Hippy Killer Hoedown can be found here.